Preheat oven to 175c/350f grease a 9x13 inch pan and line with parchment paper. 1.Make the crust: In a large bowl, beat softened cream butter. Add salt and brown sugar, cream 2-3 minutes on medium speed. Add flour and knead it with your hands. Place into greased pan, spread the dough all over the pan. Prick holes, place in preheated oven and bake for 25-30 minutes, until golden brown. Remove from oven and allow to cool. 30-45minutes. 2.Make the caramel: Make 2x the caramel sauce or use 400 ml caramel sauce. 3.Pour caramel sauce over the shortbread, place in refrigerator and overnight. 4.Cut: Remove the shortbread/caramel from the pan by lifting the foil over hang. With a large knife, cut once vertically down the middle and then cut eacht half into 10 horizantal bars. You can cut the bars larger or smaller if you like depending on your preference. 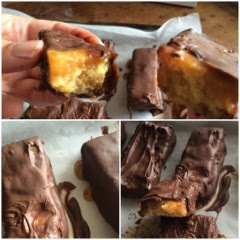 5.Dip in melted chocolate: Line a sheet with parchment paper, dip each bar in the chocolate, let the excess drip off, and then place on sheet. Place in refrigerator for 30 minutes. Serve at room temperature or freeze for up to a month.